I recently had the opportunity to use a pair of PolarPro's QuartzLine filters, a circular polarizer and a solid ND16 neutral density filter. These represented my first foray into PolarPro's extensive line of products and their offerings have expanded today with the release of two new Variable Neutral Density (VND) filters, the VND 2-5 Stops filter and VND 6-9 Stops filter. I was fortunate enough to be able to use the filter ahead of today's announcement and will be able to share some sample images and general thoughts about PolarPro's latest product. Like the QuartzLine filters, the packaging, presentation, included accessories and build quality of the filter itself is excellent with the new VND filter. I had the 6-9 stop version in an 82mm size, which I used natively on my GF 23mm f/4 lens and used with an adapter ring on my GF 32-64mm f/4 zoom. Created in collaboration with well-known visual artist Peter McKinnon, the Variable Neutral Density filter arrives in an excellent box, complete with gold embossing and a nice slip cover. As soon as you open the case, you are treated to a lovely photograph on the interior cover and a rugged magnetic case for the filter itself. It also comes with a rubber lens cap, which works well. PolarPro's Defender lens cap shown alongside the new 6-9 stop Variable Neutral Density filter. Regarding the quality of the filter itself, it has a brass ring which has the different ND stops (6, 7, 8 and 9 in the case of the 6-9 stop version) etched into its ring. The ridged ring is easy to grip and rotates smoothly without feeling loose. It is easy to precisely dial in the appropriate neutral density strength thanks in part to the quality of the build and the easy-to-read numbers on the filter ring. Compared to the ND16 filter I used, the new Variable ND is noticeably thicker, although not so thick as to cause any issues with vignette when shooting at a wide angle. The filter has a nice ridged brass ring and etched stop markings. Image quality through the filter is excellent. There is no perceptible decrease in image quality or resolution and there is also not any type of problematic color shift. Being able to quickly go from 6 stops of neutral density to 9 stops is really nice. It may not sound like a huge range, but in practice, it allows for quite a few different shooting opportunities when in the field. If you owned both the 2-5 and 6-9, you would be covered for almost any situation. In fact, you will be able to purchase both in a combo pack for $499.99. Separately, the 2-5 stop filter will cost $249.99 and the 6-9 stop filter will cost $299.99. They are available for purchase now. With that said, I think that the flexibility afforded by a variable Neutral Density filter and the overall quality of PolarPro's newest offering make it money well spent, especially for landscape photographers and those who like to record video with fast apertures. You can purchase the new filters in 67mm, 77mm and 82mm by clicking here. 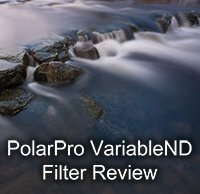 As I mentioned in the review, PolarPro sent me the 6-9 stop VND filter for my own personal use and for the purposes of this review.